Ever since the smart car was first launched, I've thought they've had the wow factor. And now, with the launch of new smart forfour, families can really get the most of the smart brand. The new forfour has more doors and more space and is an interesting option for families in cities and built-up towns whether they're on the school run, or a family weekend away. 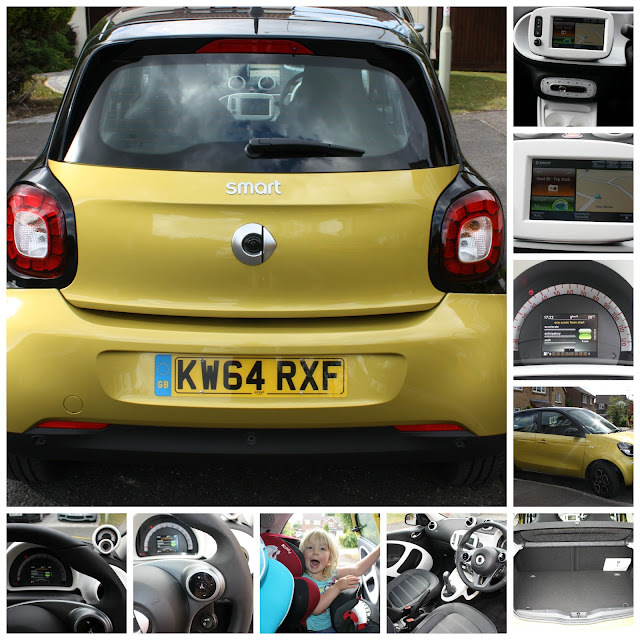 As the driver of a huuuuuuge estate car, driving the smart forfour came as a bit of a shock to the system. It is really very compact and all my normal worries about finding a reasonably sized parking space instantly melted away! Inside, it doesn't feel compact at all, in fact, the rear seats feel airy and spacious because there are only two of them...leg space was at a premium though, even for Lara (who is tall for her age) and I probably wouldn't choose to travel in the back myself! For me, the two biggest plus points of the new smart forfour, in terms of family friendliness were the wide opening doors and the ISOFIX seating. When you're trying to put a toddler into a small car, you need all the space you can muster and I found the best-in-class extra wide opening doors to be a godsend and something which sets this car apart from others. I also found the rear seat ISOFIX connectors to be astonishingly easy to use - by far the best of any car I have tried to date, even in my ParentWheels days. One of the things putting me off finally buying a second car is the need for two sets of kids car seats; but when it is this easy to move the children's car seats in and out, I'd have no problem keeping just one set for both cars! For a compact car I was impressed by the sturdiness of the chassis of the car and the chunkiness of the tyres. Check out Tyre Shopper UK for tyre options if you are looking to replace yours online. I will admit that I wasn't wowed by the driving experience in the smart forfour - the ride was smooth enough but the lower gears weren't responsive and, despite the gear-change indicator, I never quite got to grips with the gearbox and found the shifting to be lumpy. The smart forfour comes with a digital display, as well as a digital central console (which allows access to phone connectivity, radio and satellite navigation) but Mr. B. 's favourite part was the eco score. For him, the challenge of keeping his eco score above 90% was a daily motivation and we ended up competing to see who could get the best acceleration, anticipation and shift scores. The smart forfour can give you up to 67.3 mpg which means that it should be economical and cost-friendly to fill up. General maintenance of a vehicle such as the smart forfour is more affordable these days if you are happy to shop around online for parts such as tyres or exhausts, all with mobile fitting. Online suppliers such as National.co.uk offer very competitive prices and mobile fitting means you don't have to do it all yourself. From the outside, the smart forfour is bright and fun and looks just as eye catching as its two-seater cousin. On the inside though, I was a bit disappointed by the trim. We drove the middle-of-the-range prime trim with panoramic sunroof and leather interior. The quality throughout was excellent, but the facilities felt a bit...basic, and didn't seem to fit with my image of the smart, luxury Mercedes brand. The door trims and dashboard layout didn't tick very many boxes; decisions such as the display of the rev counter as a separate analogue dial, rather than as part of the digital display didn't seem to afford much cost or space saving, but did contribute to an overall feeling that I wasn't being spoiled. My biggest negative of the smart forfour was the noise levels within the car - I know this is to be expected in a small car where you are close to the road, and the engine, but I found it really noticeable, especially when I was trying to talk to my girls while I was driving. Despite this, both my girls very much enjoyed the novelty of the smart forfour - the colour and the compact size certainly turned lots of heads on our travels over the week. For a small car, the boot space is reasonable - we easily fit in our family shop for the week but I think you'd have to be picky about choosing a pushchair to ensure it fit in the boot comfortably. The back seats recline to make more space if you need it. The smart forfour is available in three models – passion, prime and proxy – plus a choice of 71hp or 90hp turbocharged petrol engines, the smart forfour is priced from £11,265 OTR.